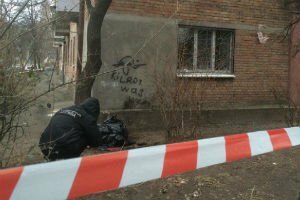 A man died as a result of an explosion in Kyiv's Solomyanskyy district on 26 December, the Interior Ministry's press service has said. "We were notified about an explosion in Donetska Street at around 1035. An investigative team and an explosives squad immediately left for the scene. The law enforcers have learnt that the explosion took place near a residential building, killing a 42-year man, damaging a wall of the building and a car parked nearby," the statement reads. The 112.ua TV channel later reported that the man went out with a pram. His wife was to bring the baby out in a while. The man tripped some sort of an IED which is being identified now. Police are searching the area for any potential explosives.